We provide golf services in Middle East. Get cheap green fees, quickly and securely online with Tee Times For You, the experts in online Golf. Due to the amount of Green fees we book, we can offer discounted green fees. We give each client a special treatment and we have the latest information on the status of the golf courses. Stretching 7,538 yards with four sets of tees allowing players a selection of differing lengths from which to play. 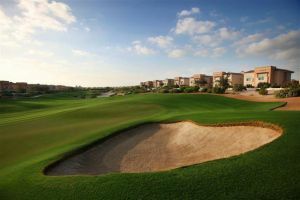 Set on undulating slopes of native desert vegetation, it is a links style layout combining traditional classic design.